Travelling around Tallinn was one of the most difficult I have ever encountered around Europe in a tourist’s perspective. Not only was the journeys difficult, tickets were also confusing to obtain. There were also only a number of modes of transport you can use as metro and trains are non existent in the city. Walking- If fit the capital is small enough to walk around ,most of the attractions within the city are very close together, so walking is very convenient. Bus – The Buses in Tallinn was very cheap however, you can buy your tickets before you board from some machines situated in some stations, however this can be very difficult to find as there is not many around. It is also possible to buy your ticket from the driver however this can be very difficult when the bus is full. Trams- Similar to buses this vehicle is easy for locals but somewhat difficult for tourists. Reason being is that you have to buy tickets before boarding, usually done online which for tourists could be somewhat daunting. There are not many machines around and there is no way to purchase from the tram operators. Taxi’s- Cheap compared to other countries around Europe but still expensive compared to the other forms of transport in the capital. Travelling around Rovaniemi is not too difficult. There are only a few ways to get around the various attractions some more expensive than others. Walking- Within the city centre walking around is somewhat easy as points of interests and hotels aren’t too far from each other, the only difficulty may come from the snow (if travelling in winter). However from the city centre to the more outer attractions such as the Santa Claus village it would be a much longer and a little more difficult. Rent a Car – Probably the easiest and more convenient way to get around, nearly all the attractions and hotels have car parks. Traffic is also none existent here in Rovaniemi, however the only difficulty may come from snow and ice a dangerous feat for those not used to the driving conditions. There are collection points and companies near the airport. Bus – I did not use the normal public buses so I know very little about them, however I did use the special tourist bus called the ‘Santa Express’ which travels to and from the airport, the city centre and all major attractions in Rovaniemi. The express bus only had limited times, I believe for when flights arrive or depart. It is easy to use but these buses can get very busy. Tours – Probably the best way to get to and from your artic activities is a pickup/drop off which is usually included in any tours and activities you book. These are very convenient as all you’ll need to do is see your driver in the reception area and they’ll take you to the location you need, this way you can never be late as your driver will probably be your guide. The Finnish capital Helsinki has an integrated public transport system where tickets are valid on all mode of transports whether trams, metro and buses. It had the easiest transport system I have taken from the airport to a city as a tourist. Walking – If you are fit enough and have the ability to walk around for long distances, then I believe walking around the city is the best way to get around. Take stops in a few places for rest and you should be fine for a whole day. Trams – For those unable to walk then I’d say trams are the best mode of transport to use within the city. They come often and are easy to use but remember to purchase your ticket before getting on. One thing to remember is that like any public transport around the world you can expect busy periods where the trams get very full. Trains – Better for longer distances like the airport, or other regions. Again very easy, just buy your ticket ahead of boarding. There are no barriers but ticket inspectors and for passenger comfort there are power outlets, small tables, bins and lots of luggage space. Metro – I didn’t really have the chance to ride these as walking and trams were sufficient to get around the place. I did notice that the Metro doesn’t cover a lot of destinations. 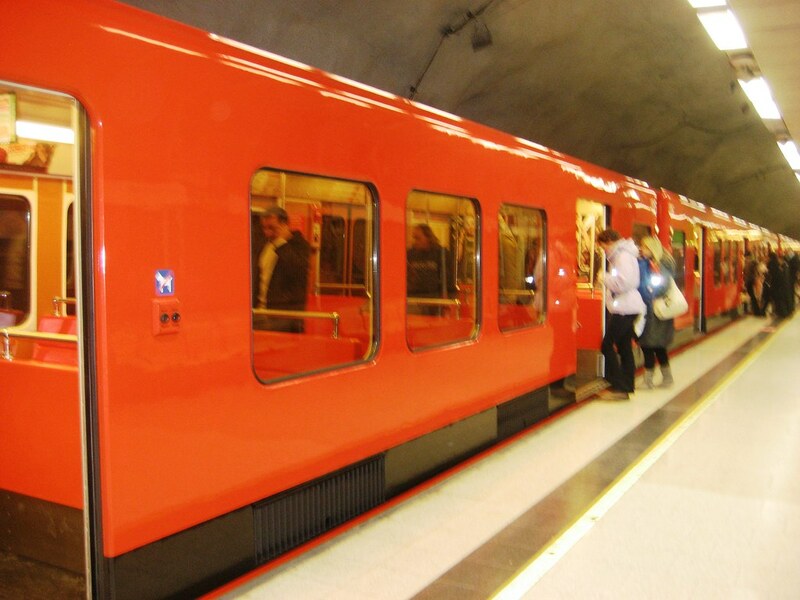 The Helsinki metro is the worlds northernmost metro system. Bus – As trams were already a brilliant way to travel, I didn’t really have the chance to try their buses. Estonia is a small country in Europe just celebrating 100 years of its initial independence from the breakdown of the soviet union in 1918. Its capital is Tallinn where first settlers dates back 5000 years which makes this city one of northern Europe’s oldest capitals. Today the city has a population of around 444,085 about a third of Estonia’s total population of 13.3million. Estonia’s capital Tallinn was the last place I visited from my Finland/Estonia trip. My first impressions of the city was that it was too quiet and there was not too much going on. I also had the impression that Tallinn was not huge on tourism as I only saw locals and workers on my journey from the airport to the city centre, not a single tourist which was a very new experience from any trips ive done. Furthermore the journey to my hotels was not very easy for a newbie tourist like me, I had to use google map and even ask a friendly local for help, even with these I still managed to get lost. In addition paying and using the trams were also confusing, although very cheap at 1 euro there was no way to pay using cash and I believe everybody has a special travel card (like the oyster card in London), I could also hardly find any ticket machines even at larger bus stations. Tallinn is very small and the main area to visit is the Vanalinn district or the Old Town which has one of the best preserved medieval structures in Europe. Along with all the winding cobblestone streets, gothic spires and fairy tale like architecture, stories within the city will both amaze and enchant you. Within the old town there is a huge collection of different points of interests for tourists, you will probably pass along many of their significant buildings but not notice them. Best way to see the town is by joining the free walking tour which can be arranged in the tourist information centre situated in the middle of the old town. From my perspective the best places to see in the old town are the Alexander Nevsky cathedral, Vanalinn district, Toompea castle and a few others. Firstly you must visit the Alexander Nevsky cathedral which graces Toompea Hill, this orthodox church built by the Russians during their occupation of the capital in around late 1890 to early 1900. The cathedral was frowned upon by many Estonians around 1924 due to the symbol of Russian oppression and was due for demolition however with lack of funds this was never implemented and its beautiful architecture still stands today. Neighbouring the cathedral is Toompea Castle which was an ancient stronghold but now houses the country’s parliament. The castle has both a unique blend of modern and old whereas the walls and towers are of the ancient stronghold whilst the entrance is of modern designs. Behind the building stands the Tall Hermann an important tower which stands high above Tallinn which currently holds the Estonian flag and has held flags of different occupants of the capital. A three minute walk from Toompea in a more secretive area lies the Danish King’s Garden which is a brilliant place to find. There are many different legendry stories that has happened here but most notable of a falling flag which changed the favour of the battle to King Valdemar II. The small garden is a brilliant place to stop by and relax, there are also a few vendors here for quick snacks. Also situated within the garden are three statues of headless Monks one of which is praying, another that is begging and the last which keeps watch. There is a few different meanings to these three statues but its erection is unlike no other in the world. There are two amazing views high above Tallinn the Kohtuotsa viewing platform and the Patkuli viewing platform. The two different platform are difficult to find with the maze like footprint of the town, but once found these picturesque sights are a pleasure to see. Yearly around mid November Tallinn is especially a nice place visit due to their charming Christmas Market which is famous around the world. Situated in the town hall square the market hosts a number of stalls ranging from food, clothing, souvenirs and traditional products around a central Christmas tree and a stage for festive performances. Probably one of the cover landmark of Tallinn is the Viru Gates which was part of the city’s defence on the 14th century. These two towers are now a popular place for photographs and are said to be the main entrance to the old town. You will see plenty of different significant churches spread out in different locations around the old town. St Nicholas Church, Swedish St Michaels church, Holy Spirit Church and many more are worth the visit. All have different stories which may be of interest to you. There many also many other attractions outside of the old town which are worth a visit like the Kadriog Art Museum, Maritime Museums, Open Air Museum and others a like, but I didn’t have the chance to see these as I took my trip to Tallinn pretty easy and relaxed and ran out of time. Lastly another important monument to visit which unfortunately was under refurbishment when I visited is the War of Independence Victory Column, which is situated in Freedom Square. Overall Tallinn is a beautiful little city brilliant for an excursion whilst visiting other Baltic or Nordic regions. The city has both new and old attractions and particularly appeals in the winter festive season as its Christmas markets has always been highly received. I do feel their public transport trams and buses to be highly impractical for tourists. However Tallinn is small enough to be able to walk around without the need of transport. The city is affordable and couple of days is enough anything more may result in boredom, saying this if you stay longer it is a brilliant city to take it easy and relax as I did. All in all a thumbs up for me, the city’s charm is unlike no other. Rovaniemi is a city north of Finland known to be the home of the world famous fictional festive figure Santa Claus. The city is also the capital of Lapland and is home to the Arktikum one more famed museums for science in the artic region. Rovaniemi also crosses the Artic circle which only covers a division of a few countries. Rovaniemi was the second city I visited on my trip to Finland and Estonia. There are many reasons why I wanted to visit this winter wonderland, for snow, for the different winter activities, for the winter culture and finally as the city is famed for being the official home of Santa Claus the festive magic. I flew into Rovaniemi from Helsinki on a 1.5 hour flight and arrived early morning to a sleeping city (I guess they have late nights here). As check ins in many hotels are late around (3pm), an early arrival to the city proves a little difficult. First thing is first to try and drop my baggage somewhere then I am free to roam. The main thing to do is leave your luggage at your hotel (sometimes they may even let you check-in), but if you do not have a hotel ie Airbnb or apartment then there are various bag drops around the city including the airport and shopping centres. Furthermore it is a usual occurrence where visitors do not have the correct clothing for the winter weather. If you get caught out by the cold there are many places where you can rent winter clothing, accessories and shoes. Once you are ready, the city is a pleasure to roam, everything I write will be expressed in a winter season. Rovaniemi does not have plenty of attractions but the scenery around are some of the best picturesque scenery you will ever see. Take note that some places are within the city centre but others are a ride away, there is little public transport but if you join a tour or activities usually they will pick you up, other than that it may be a good idea to rent a car. Firstly I’ll start with the main stage for Rovaniemi, ‘Santa Claus Village’ which is a multiplex resort famous for being the home of Santa. This attraction which is open throughout the year and has various accommodations, souvenir shops, pubs, restaurants, and a number of amusements making the attraction a world of its own. However the main reason why this place is so important and visited by masses each year is that this is the main place to see Santa Claus in the place he is known to live. When I visited, there was a little line. Furthermore, Santa’s post office is also situated here where you can send letters and the recipient will receive a special artic seal. The Arktikum is a magnificent science museum which fixates on the artic and northern studies. The museum is in my opinion the only major attraction within Rovaniemi city centre. Permanent exhibitions include “Northern Ways”, “Polar Opposites”, “Finland on the Coast of Artic Ocean” and the “Artic Change”. Further to that there are plenty of temporary exhibitions which changes occasionally. In my opinion the Arktikum is a brilliant visit whilst in Rovaniemi, its good to enjoy the Lapland and the artic but knowing the science behind it is equally as important. Other attractions to visit are Santa Park and Ranua zoo which I didn’t personally visit as I would expect these to be a heavily for families with young children. Santa park is a indoor theme park according to their website the best Christmas destination in the world. Situated near Santa Village this theme park includes elf schools, ice galleries, ginger bread making and much more alike. Ranua zoo which would be like no other zoo in the world as its animal residents are of the artic and northern species, including polar bears, reindeers, artic fox, brown bear and a lot more. This attraction as the name states is situated in Ranua which is an hour drive from Rovaniemi, there is daily bus service from Rovaniemi to the Zoo. However if you book a tour this will usually include the transport. Apart from attractions people go to Rovaniemi for the many winter activities and tours. Popular activities include the reindeer sleigh, husky sleigh, snow mobile, snow shoe, ice fishing and many more. Tours include the aurora safaris, amethyst mines, Korouma and others alike. There is numerous different activity and tour operators and each activity was very expensive so I only managed to do two, a husky sleigh safari with “Husky Point” and a night snowmobile aurora tour with “Wild Nordic”. The husky sleigh safari which would normally need a minimum of two people was fun and a great adrenaline rush, it started from an early pickup from my hotel, gear fitting and a tutorial. The sleighs were divided into two parts, the passenger and the driver which you will take turns, hence two people required however if you are a solo traveller like me you will be riding with the guide. The husky dogs were unbelievably fast and the scenes seen from the safari was unbelievable. After about a 20-30 minutes ride, you stop over a brilliant scenic hill top with a hut for berry juice and biscuits. After a changeover of drivers you will then head back and will be toured around their farm. After your time at the farm you will then be driven back to your hotel. The night snowmobile aurora tour was also a fantastic experience, you will aswell be picked up from your hotel, dressed and go for a tutorial. You start by walking 10minutes to the location of the snowmobiles then after you will get further training on the vehicles. This particular tour was nice but there was little to nothing to see whilst on the trail. You will stop at a quarter point to check if everyone in the group is ok, then you will go ahead to the mid point where you will stay an hour or two to hopefully picnic under the northern lights. Unfortunately for me there was nothing to see and the chances was only a level 1. However all was not lost as the experience of the picnic under the night sky on a snowy swamp was unlike no other. The picnic included sausages and marshmallows to be cooked on the camp fire whilst sipping on some hot berry juice. An outstanding tour however out of the two the husky tour had more of an adrenaline rush. Lastly Rovaniemi is just a pleasant region to roam whether within inner or outer edge of the city centre, forest or into the artic circle the capital has spectacular sights. The city centre is relatively small, there is various restaurants scattered around, a high street and two malls for shopping. The city centre has a few scenic walk paths on the edge of the centre one of which I took passes the Arktikum and has views of the frozen river. There is also an artic hike path which I wanted to take but didn’t have the time. Overall Rovaniemi was everything I thought it would be, a heart warming winter wonderland for young families with winter activities for both young and old. Rovaniemi proved to be very expensive for nearly all the aspects of travel including transport, hotels, food, activities and also souvenirs. Nonetheless the city is a brilliant place to visit as there is something for the everyone. Although there is only a few attractions its beautiful scenery makes Rovaniemi great for photo opportunities. Best to stay for a duration of 3-5 days but this may be a little heavy on your pocket. It is ok to visit Rovaniemi as a solo traveller but it may be better to visit with someone as many of their activities requires a minimum of two people. In conclusion I highly recommend Rovaniemi as a festive trip for families to feel the full scale of the city’s magic, however travelling with friend or solo wouldn’t be bad at all as there is just so many things to do. My last trip of 2018 and I have decided to fulfil a winter trip north of Europe into Finland and Estonia. Whilst in these two countries I have decided to visit three capitals, Helsinki the capital of Finland, Rovaniemi capital of Lapland in Finland and finishing the trip with Tallinn the capital of Estonia. Landing in Helsinki which will be a centre base for me. An easy public transport for tourists like me to use. Maybe one of the main purpose of the trip was to see Lapland and enter the artic circle. This winter wonderland really did shape the trip. I used Helsinki as my base so really as there was no flights direct from Rovaniemi to Tallinn. But instead of directly transiting through I thought to stopover for a night to visit other areas I didn’t manage to visit. A worthy relaxing end to the trip. Three days in the Estonian Capital, probably one of the most difficult public transport for tourists but once within the inner city a pleasure to get around by walking. Points of Interest: Senate square, market square, Temppeliaukio Church, Suomenlinna, Helsinki central station, Uspenski cathedral, Kamppi Chapel, Sibelius Monument. Helsinki is the capital city of Finland and the country’s largest with around 600,00 in population. According to various sources Helsinki is one of the best places to live and has the better standard of living around the world. Although Helsinki’s population grows every year it is still considered one of the smallest. Helsinki was the central point for me on my travels to Finland and Estonia. I stayed in the capital first then branched back and forth to Rovaniemi and Tallinn eventually ending and flying back home from the city. Before the trip my research into the city showed that there was not plenty of attractions or points of interest within the city, it also doesn’t have a monument or building with the magnitude comparing to the Eiffel tower or statue of liberty. However my first impressions of the city was that it was very artistic or art conscious with plenty of the streets having its own decorative designs, even as simple as a street light had a modern imaginative design. As you start to roam the city in depth you will start to realise why the city is one of the best cities to live in (according to metropolis 2016), and not such a bad place to visit as a tourist. Firstly a must visit for tourists is the Helsinki cathedral which is situated in the Senate square. Built around 1852 this Finnish Evangelical Lutheran cathedral which is operational and performs mass services proves to be the main stage for tourism in the capital. The cathedral which has huge historical significance to the city proves to be an area where tourists flock to take pictures. Senate square marks the centre of old Helsinki and is a good example of neoclassical architecture, the square is surrounded by the government palace and the main building of Helsinki University and the Library of Finland all equally as picturesque within the square. Furthermore the city’s main Christmas market is placed here at the start of December each year. In my opinion the market was the cleanest and neatest of all Christmas markets ive been to its relaxing ambience and sauna was something new, but it was too quiet for my liking. Nonetheless their products were much better quality than that of other markets and food were outstanding. The Christmas market is worth a visit if your around the city at that time but I wouldn’t set up a trip solely for this market. Other churches that are worth a visit are Temppeliaukio church, Uspenski cathedral and Kamppi Chapel. Firstly the Uspenski orthodox cathedral which was built around 1868 is advertised as one of the city’s main place to visit, with its red bricks and golden cupolas the building is and interesting place to visit. Although a great piece of architecture with a nice of history for me it wasn’t something spectacular and I see plenty places of worship on par with this one. A more modern religious structure which was only completed on 2012 is the Kamppi Chapel. Built with local Finnish wood in the centre of one of the city’s busiest street the chapel also takes the name of “Chapel of silence” as it is meant to be a place of calm a serenity within the city. Lastly in my opinion one of the most fascinating place to visit in Helsinki is the Temppeliaukio church which is unlike no other church I have ever seen from all my visits. The architecture is different in that the building is excavated straight under solid rock, its roof is a large copper dome like plate supported into the rock by beams and when the sun shines proves to be a spectacular sight to see. The church built by architect Tuomo Suomalainen on 1969 is the best spot I visited in the city and I highly recommend this place. The Sibelius monument built in dedication for the Finnish composer Jean Sibelius located in Sibelius park is in my opinion the best piece of art work within the city. Built with 600 hollow steel organ pipes built in a wave to portray sound waves with the composers face protruding in front of the monument is a nice sight to see whilst walking around a admirable park. Another popular place for tourists is a visit to Suomenlinna island . I did not particularly have time to visit this place as I ran out of time but am told this is another must go area to visit. Reached by boat included in the day passes or tickets in the ordinary machines around the city the island has enough to consume a full day. The UNESCO world heritage site use to be a fortress for the Fins, Swedes and Russians. The island has beautiful sights, museums , restaurants and cafes. Helsinki central station is another place to see. You wouldn’t need to go out of your way to come across the central station as it will probably connect your hotel and any points of interests you visit. The station was voted the worlds most beautiful station in the world in 2013 (BBC) and has consistently been within the top batch each year in various lists. The station initially opened on 1862 but grew after a competition on 1904 where it was then designed by Finnish Eliel Saarinen and reopened 1919. The station has 4 large sentry statues which hold spherical globes illuminated oversee the masses of people go in and out of the station, this is the sight to see. Other places to see is Market square and the city’s various shopping districts. The Market square which is in the eastern most part of the city nearby the senate square and adjacent to the presidential palace is another of the most recommended areas to visit by various tourism media. Why? I am not too sure why. I visited the area three occasions during my visit at various different times but I didn’t see the charm of it. However shopping in Helsinki in the many different districts or malls is a must. The many places such as Kamppi centre, Galleria Esplanade and Kluuvi shopping centre is just some of the places for a nice shopping atmosphere. Beware that items in Finland is a bit more expensive than others countries in Europe. I don’t usually recommend particular restaurants or bars but the ‘Oluthuone Kaisla’ 10minutes from the Central station is one of the best craft beer in town, It was a brilliant atmosphere whilst visiting two friends that I met in a backpacking trip in Peru. There were a huge choice of beverages including Finnish and Estonian Beers. It was fairly relaxed and quiet when I went there but am told weekends is busy. One of the highlights of my visit. Helsinki does not have any attractions that would compare with the magnitude of Paris’s Eiffel tower, New York’s time square or London’s Big Ben however the city’s beauty is with its lifestyle, arts and atmosphere. Within the city and from the airport Helsinki had one of the easiest public transport system from all the places I have been which is always a big plus for me and would be for tourist in general. Nonetheless once within the city all attractions are a walkable distance. However the city was expensive which wouldn’t be very attractive for the common traveller. Overall all I can say is Helsinki is a beautiful place to unwind get to know new cultures, try new beers and appreciate some history, you have to be open minded as the city isn’t as extravagant as other European capitals but it does have brilliant characteristics. A two to three day stint in the city is enough time to roam the city and enjoy its prestige.